Here at RKM we like to think of ourselves as skin geeks, a collective obsessed with skincare. 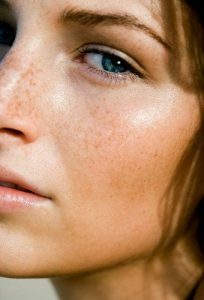 This is never the case more than in the summer, when glowing, dewy skin is top of our wishlist. But while we all want to go fresh faced as soon as the sun begins to shine, a few very real factors mean bad skin and summer time can go hand in hand. Luckily, we at RKM have the answers. We all know sun exposure causes dehydration, but it’s a little-known fact that this in turn stimulates oil production, as our skin tries to correct the issue. The solution could be HydraFacial, a three-stage extraction facial which nourishes skin with powerful moisturisers that quench skin with effective serums and antioxidants. The best part? The gentle treatment causes no redness or downtime, meaning it’s the perfect treatment to have before a big summer event. While we all know suncream is an essential summer staple for skin protection, constant application of the stuff can lead to congestion, blocked pores and breakouts. ZO Medical Oilacleanse™ gently removes impurities and targets excess oil to reveal glowing skin. What’s more, Jojoba Beads in this cleanser provide gentle exfoliation, ideal for skin struggling with unwanted outbreaks. Soaring temperatures also stimulate our skin’s oil glands meaning we see an increase in sweat production. This isn’t a bad thing, but it does mean we need to limit the amount of make-up on our skin – liquid foundations can be particularly bad as they sit on the skin which will prevent your sweat from flushing out the cell debris in pores. AlumierMD Moisture Matte Broad Spectrum Sunscreen SPF 40 contains a combination of zinc oxide and titanium dioxide, both physical filters to protect against the sun’s rays, while the colour-encapsulated technology blend on the skin creating a sheer tint and healthy glow which can be used in place of your daily foundation when the mercury rises. Annoyingly, changes in skin pigmentation can worsen in the summer as sun exposure is higher. Teoxane’s RHA x VCIP serum has superior efficacy in boosting the synthesis of new collagen and free radical scavenging compared to other forms of vitamin C with brilliant anti-pigmentation results. The right intel and skincare regime means we can all have healthy, radiant skin all summer long. Time to get glowing!